GardenSoxx® last an average of two growing seasons without additional fertilizers or nutrients. After two seasons, the plants begin to deplete the nutrients in the Filtrexx® GrowingMedia™ or compost. Depending on preference, fertilizer can be added to the GardenSoxx or it can be cut open and the GrowingMedia or compost can be used as mulch for garden beds. After a killing frost, cut the plant level with the GardenSoxx, leaving the root ball inside. The root ball will continue to decompose and add nutrients back into your GrowingMedia or compost. Store GardenSoxx outdoors through the winter, as this will keep them moist and full of nutrients in the spring. Leave them where they lay, or move to an area out of the way. GardenSoxx last at least two years following this method. Simply rotate crops, and plant in the same holes in the spring. There will be less nutrients in the GrowingMedia or compost in the second year of growing. Nutrients or fertilizers might need to be added. For strawberries, simply let the plants go dormant in the fall. In the spring, when new shoots begin to emerge, simply cut away the dead foliage to allow sunlight to reach the new, young leaves. Most perennial plants will take permanent root through the GardenSoxx mesh, into any soil below. Leave it in place during the winter and clean up as needed in the spring. Follow our simple steps to plant seeds, plugs or bare root plants in GardenSoxx. 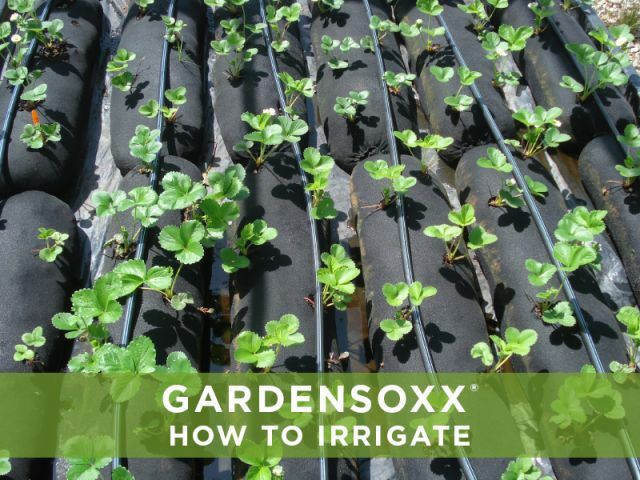 Discover how to sufficiently water plants and different irrigation options for gardening with GardenSoxx.